Welcome to Marvel Strike Force Heroes page. This is the full description of MSF Wolverine stats, skills and abilities. Wolverine is a vicious brawler who shreds his enemies with Piercing attacks and Bleeds. His first skill delivers medium Piercing damage and applies Bleed on critical strikes. His second skill hits primary target and chains to up to 4 additional targets for medium Piercing damage. Wolverine ultimate assassinate target for 610% Piercing damage and applies Offense Up on Wolverine if his health is under 50%. Wolverine passive ability grants him healing of 10% of his health at the start of each turn and chance to Revive upon death. Wolverine price is 50 shards and he is easily collectible since his shards are obtained from daily objectives rewards. His shards can also be gained through Mega Orbs and Premium orbs. Wolverine is a mutant armed with adamantium claws that ignore armor and tear through his opponents. 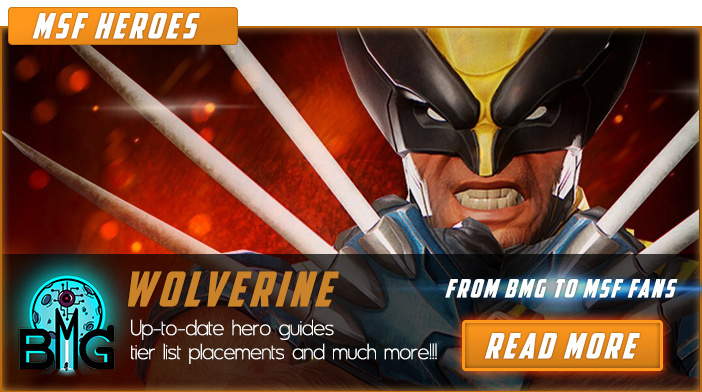 We hope that you enjoyed the description of MSF Hero Wolverine. For detailed information about other MSF Characters check our MSF Heroes page.